Matt Anderson and Justin Lai are local artists. They also teach at schools, sharing indigenous culture, knowledge and skills. Justin has a great love, respect for and understanding of the didgeridoo, and also performs and plays traditional didgeridoo with the Dianne Cummins Dance Troupe (Yugambeh Tribe, South Queensland) for ceremonies and has conducted Art Workshops for School/Students with Aunty Joyce Summers (Yugambeh). 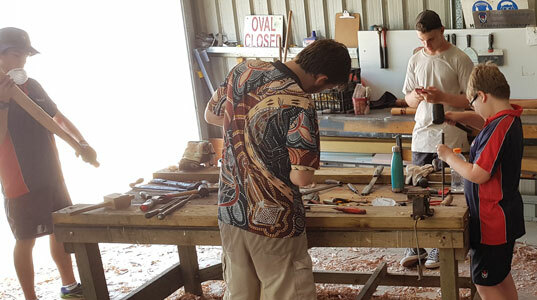 Join Matt and Jai at Maleny Wood Expo and make your own didgeridoo. This workshop is suitable for 12 years and above. Price: $210 large didgeridoo/ $150 smaller (around 1m) didgeridoo (differently-sized didgeridoos have different musical tones). Price includes Wood Expo 1 day pass. Sessions available on Saturday May 5th, Sunday May 6th and Monday May 7th. Workshops start at 8.30am each day and go through till around 4pm.